Another week, another Taco Tuesday. I hope you had an awesome weekend! Mine was busy—but good. We enjoyed a quiet Friday evening in bed watching The Lost Boys (because 80s movies are everything), entertained some friends with dinner and board games on Saturday, and ran some errands on Sunday. I’ve managed to put healthier spins on most of my cravings so far, so I really shouldn’t grumble about it. Like when I wanted tacos last week, I mustered up enough energy to make these chewy and fluffy from-scratch flour tortillas! We then stuffed them with blackened shrimp and an invigorating avocado and pineapple salsa. It was delish. So delish, that I had to move some things around on my content calendar in order to fit these in this week :) Tacos are a priority! Anyway. I Hope you dig this recipe as much as we did. Whatever tacos you mow down today, I hope they’re awesome. 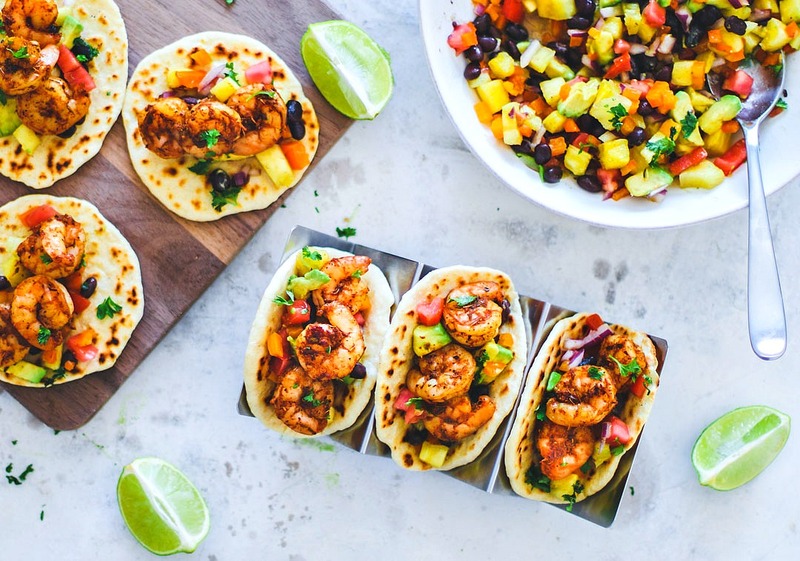 These blackened shrimp tacos are wonderfully punchy, and the spice is balanced out with the cool and refreshing flavors of the avocado and pineapple salsa. blackened seasoning (about 2 TBSP) Use recipe below, or use a good quality blend from the store. 8 tortilla shells See notes* for my homemade flour tortillas! 1 cup diced fresh pineapple Most canned pineapple is flavorless, so stick with fresh! 1/2 cup diced orange bell pepper You can also use red or yellow; green is less sweet. Cast Iron Skillet See notes* if you don't have a cast iron skillet. If you need to shell and devein your shrimp, do that now. If your shrimp has come shelled, deveined, and without tails, simply rinse under cold water and set them on some paper towels. Pat the shrimp dry with more paper towels to remove excess water. Place the shrimp into a marinating bag or a container with a lid. Pour the 2 TBSP of melted butter over the shrimp followed by the blackened seasoning. Shake and mix the contents of the container so that the shrimp is evenly coated with butter and seasoning. Place the shrimp in the fridge while you prepare the salsa. Heat a cast iron skillet over medium-high heat. Once the skillet is hot, transfer the marinated shrimp into the cast iron skillet. Simmer the shrimp for about 2 minutes each side (four minutes total), or until the shrimp is opaque. You'll notice the "blackening" effect happening with the butter and seasoning. When done, remove the skillet from the heat. Top tortillas with a spoonful of salsa, three shrimp, and serve immediately. *Want to try this recipe with homemade flour tortillas? Check out my recipe here! *If you don't have a cast iron skillet, you can use a regular skillet. Just keep the heat to medium instead of medium-high and keep a close eye on the shrimp to make sure they don't stick to the pan. The butter should act as a lubricant, but if the shrimp start to stick, add a bit more. These have my name written all over 'em! Love the avocado pineapple salsa too! I could even eat that as is like a salad :) Not waiting for taco Tuesday for these!